Last November, we ran the 2009-10 Preconstructed Deck Championships, which pitted that season’s crop of precons against one another through four Divisions, until the exciting series final left only one deck standing: Rise of the Eldrazi’s Eldrazi Arisen. A tremendous success, we’re already looking forward to the upcoming season this Autumn, but in the same vein we’re also wanting to go back in time to previous seasons and anoint winners there as well. Thus we are excited to announce the commencement of the 2008-09 Precon Championships! For the 2008-09 season, we have a much-smaller pool to draw from as there was no Core Set or large-scale supplemental product release like the Duels of the Planeswalkers. As a result, most of the early brackets are byes. As before, seeding is completely random, and will use the same Conference/Division structure. The Championship will be divided as follows. There are two Conferences, the Rosewater Conference and the Forsythe Conference. Each Conference is further divided into two divisions. In the Rosewater Conference, we have the Nagle and Tinsman Divisions. 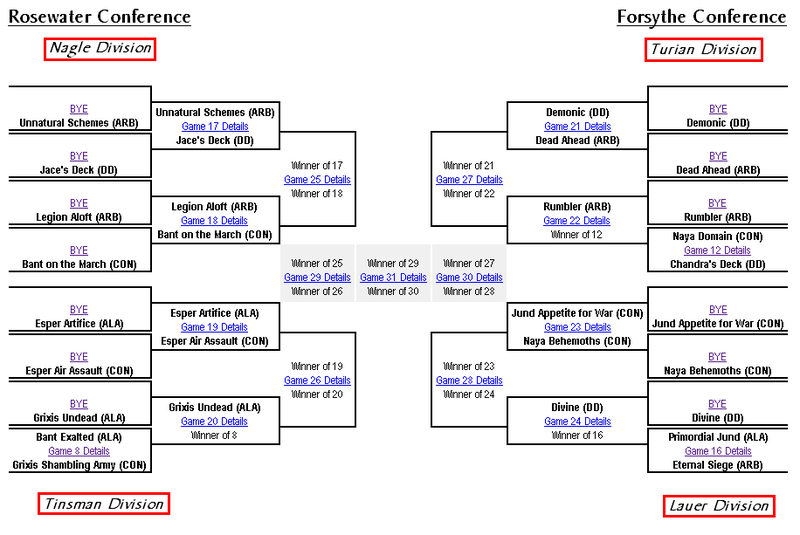 For the Forsythe Conference, you have the Turian and Lauer Divisions. As is customary, coverage will focus on each Division in turn, which we feel is far more easily followed than going from one full round to the next. We’ll give summaries up to the Final Four, when we’ll switch to the full match play-by-play we use for deck reviews. And with that, we’re off! In our next piece we’ll begin with the Nagle Division. Think you can predict the winners? Post your thoughts in the comments! I think esper will win that. That’s a lot of byes. I don’t know who to bet on. Only decks I know are the ones reviewed here and the Duel Decks. Chandra should do well I think, but I don’t think Divine or Demonic unless they get some lucky pulls will go far at all. The Bant vs Bant I’m really interested in. I love Bant. First deck I ever built without using a precon as a base was a Bant deck. I’m putting my money on March. Would love to see one of them go all the way. That is definitely a lot of byes. How did that happen? When we did the 2009-10 block, you had the following sets and numbers of decks: ZEN (5), WWK (5), ROE (5), DD: PvC (2), DD: GvL (2), DotP (5), M10 (5), PDS: Slivers (1), and Planechase (4), a total of 34 decks. For 2008-09, there just happened to be a lot less released: ALA (5), CON (5), ARB (5), DD: JvC (2), DD: DvD (2)… and that’s it! Total of 19 decks. There’s no Core Set for this year, as 10th Ed launched in 2007. There was no “Multiplayer” product, as Planechase was the first of its kind (at least, in quite awhile). There was no Premium Deck Series, as Slivers was the first. And there was no supplemental “Duels of the Planeswalkers” type of release to add a few more decks to the pool. In short, a very no-frills year. That means we either make it a contest of 16 teams with no byes, or keep the same base-32 structure. Because we’d reviewed all the decks that participated in the first competition, we could make the worst-rated decks battle out for those last 2 slots (trimming from 34 to 32 decks). Because we haven’t reviewed many of the decks this time around (yet), it seemed unfair to aribtrarily cut three, so we let random chance instead carve their fate. Control and Manipulate. Jace’s deck for the win. Nuff said. I cant say I know much about any of these intro decks, but I do know 41 card decks tend to have the advantage over 60 card decks. I think its going to be “Unnatural Schemes” VS “Bant on the March” with “Bant on the March” taking the Nagle division! Like I said, I’m betting on Chandra’s deck. Of course, I went all in on the Allies deck and it got stomped on so I could be wrong. Ironically, Chandra will face Jace if Jace wins its first bout. But, yes, I always bet on burn. I just copied the bracket array and put all my predictions down using a paint program. Just glad I did this before the first results! Now to sit back and watch how right or wrong I am. Jace will face Bant on the March. Bant will beat Grixis twice. Esper Artifice will beat the Air. Dead Ahead will face Candra’s. Siege will then go on to beat Naya. Candra will beat Eternal Siege. Bant Exalted will weather Candra’s blaze. Lock it in. Wrap it up. Let’s go Bant! Oh, the list has an error. Naya Beh is from Shards not Conflux. Noticed it when I was looking up these Alara decks. Nagle: Jace vs. Bant. Jace FTW. Tinsman: Grixis Undead vs. Esper Air. Esper Air FTW. Turian: Chandra vs. Dead Ahead. Chandra FTW. Lauer: Jund Primordial vs. Jund War. Primordial FTW. Jace vs. Chandra. Chandra FTW. Esper Air vs. Primordial Jund. Esper Air FTW. Chandra vs. Esper Air. Chandra FTW. I’m calling it for Jace’s Deck. I readily admit that I know ntohign about most of these decks. Goooooo Jace! Now that the finals have been won, looks like you got the closest, Ethan!